So, I'm not much of a poster here, but for once I've had a productive week in terms of MOC'ing, or rather designing such in MLCad. So, I figured I'd share my designs here as well. Sadly, they all lack proper interiors such as furniture, curtains and whatnot, but I figured I'd put all that in once they are done IRB. First up is one I designed way back in November, after a spurt of inspiration at a local event; Mocca House. The two shops at ground level are meant to be a pair of competing coffee-bars, which are both accessed from the central corridor. From here entrance to the central staircase is also possible, with a single, large appartment at each floor. 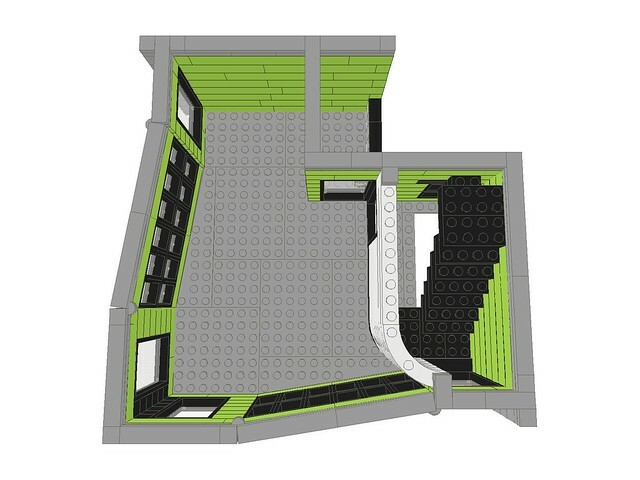 For me the modular building series is all about unorthodox building techniques, or challenging oneself to certain limits, and as easily seen on the second picture, the challenge here was to place the walls at an odd angle, in this case nine degrees, and keep it consistent all the way up to the top floor. The next one up is a building I've simply named Cream Flats, because of the tan color. This is more a planned re-use of parts for a trio of buildings I've already built, that I'm not satisfied with (lacking details, way to boxy design etc. ), plus attempting to use basic colors as well. Middle floor is repeatable, meaning I can build several identical ones and they will all stack together without problems. I was experimenting with tile-patterns for the interior - with different colors, those might stay. Shops at ground floor are at the moment planned to be a florist and a... Well, I'm not sure. Something. And finally, a design that I started on today, and which ended up very different from how I had planned it. Still, I'm very pleased with: Chocolate Corner. The initial idea was to somehow integrate this piece into a modern corner building design, and as the design progressed, it was kinda left out, and ended up looking like a much more classic and older building than what was intended. 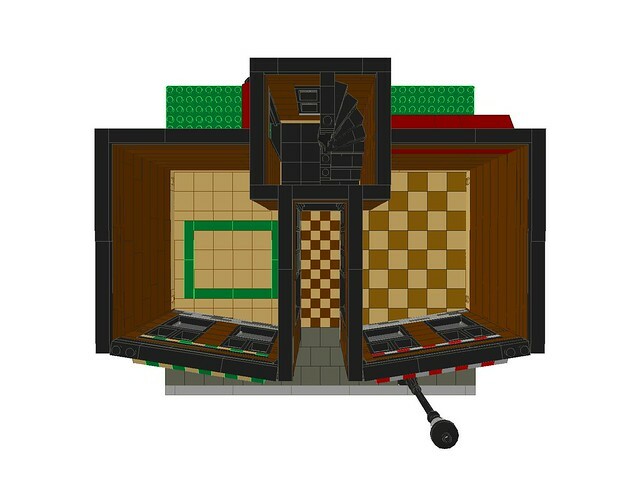 The ground floor is planned to house a confectionary, and the building's colors are themselves supposed to mimic the different variations of chocolate. Again, there's not much of an interior other than inner doors and walls, and a staircase leading up to the two appartments. I've got a few more pictures on my Flickr-account, in case anybody wants to have a closer look. Other than that, what do you think? Edit: Make that a quartet! Here's a more recent building; Bianca's Bikes. It's a simple, lime green box, with a bike-shop at ground level, but I'm pleased with the result. It's heavily inspired by AlienCat's Harry Hardware Store, but I just couldn't keep myself away from designing something similar. The wall technique is the same as on Mocca Corner, but here it's far more visible how it works. I've tested using the 3x12 wing plates as I've done here in this model, and it's a fully viable building technique. The gap between the floor and the wall closes nicely without any gaping holes or stressing the bricks. I've not posted on here for a while either, but I must say, I like these. 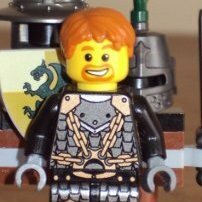 Especially the design of the first one with the slight angle to the front. 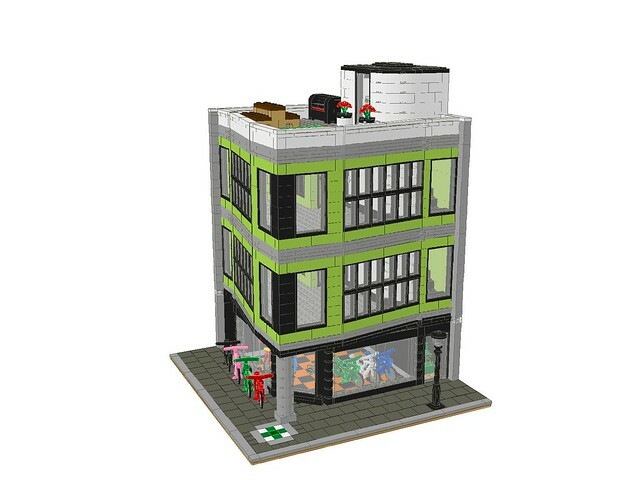 Can't wait to see these built in real bricks. I really like all three. 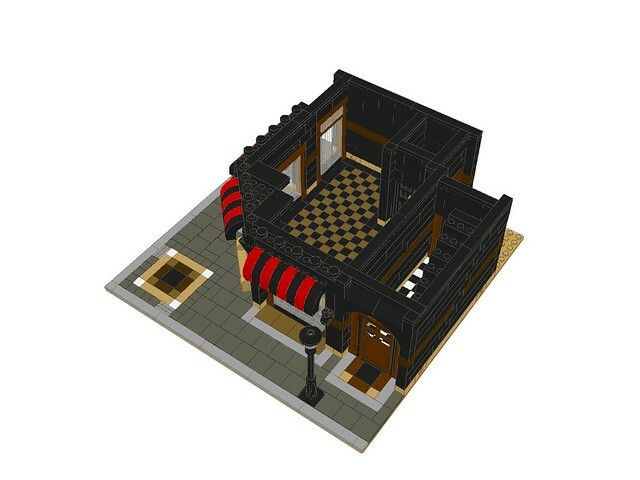 The third reminds me of a very nice reworked Cafe Corner (Cafe Corner converted me from Mindstorms/Technic to modular and buildings). 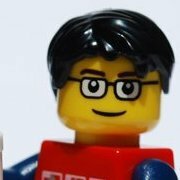 For the Mocca House, how do you plan to achieve the front wall angle in bricks? Maybe a SNIR technique? Very nice. I need to push my limits more. Thanks for sharing these, very inspirational. I love these buildings, particularly the first one with the angled walls and the top floor on the second building. The colour combinations are beautiful, as are the patterned floors! Will you be building them with real bricks? They are all great modular designs, but the first one totally rocks with it's very original sloped outwards front design......Brick On 'Freddie' ! Thanks for the kind words! They are much appreciated! I'm guessing SNIR stands for Studs Not In Row? Anyway, the technique is simple enough: the walls are simply hinged, inspired by a technique Jamie Berard demonstrated on the Creator-site a few years ago. But, they are not double hinged, meaning they are not locked in that angle, and can move about. This is planned fixed with strategically placed interior and street furniture. The walls further up the building attach to the studs of the ground-floor walls, taking care of that problem. At least, that's the theory. That's the plan, yes. Eventually. Cream Flats is likely to be the first one built, since it's pretty much based on using pieces I already have in my collection. Your Mocca House looks great with the angled facade! I also like that it is an odd number of windows wide, which lets you have that small corridor through the middle and spiral stairs at the back. Are those little inset balconies on the 2nd floor? Well done on all the buildings! Great CAD projects ...the first picture looks very complex! I really liked the fist one, mind if I borrow shamelessly from your design? Sure, go ahead. I'd kept it secret if I didn't want others to try their hand at building diagonal walls. 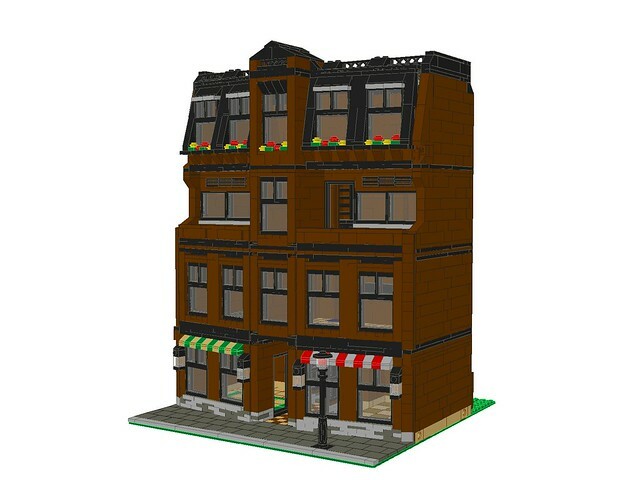 Besides, I'm not the first one to do so, AlienCat's "Harry Hardware Store" is my inspiration for Mocca House! I didn't' think about the hinge idea, not sure if I saw the demonstration. Is it still up? 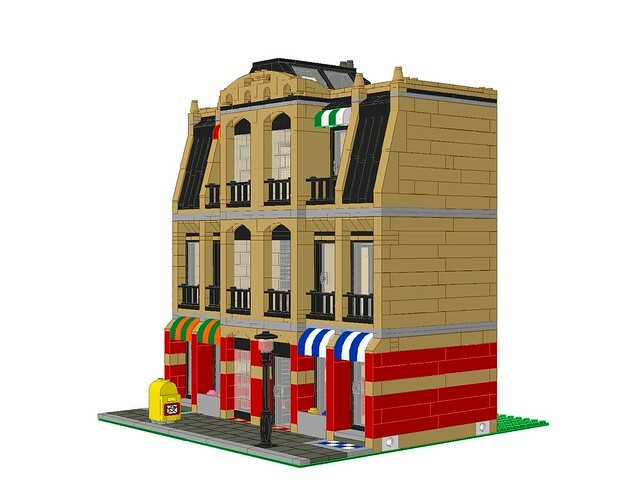 Looking forward to seeing the Mocca House in bricks. That's a nice set of buildings. The angled walls on the Mocca House are a great detail. They all look great but I'm partial to the Cream Flats. 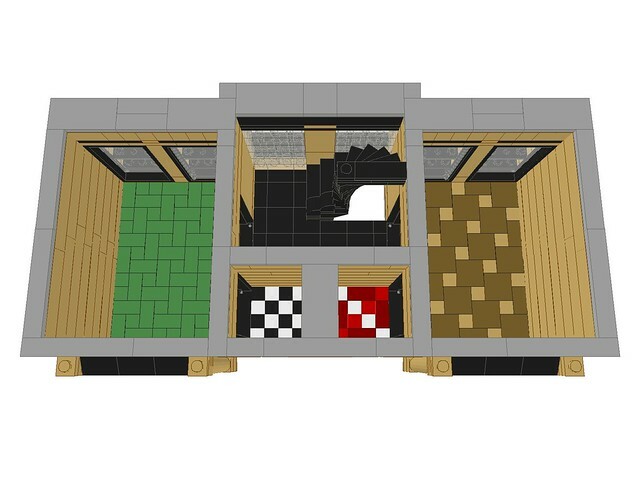 Love the idea of the repeatable floors you have the option to build. Nice work and great choice of colours. I also love the way in which you have angled the front facade on the Mocha build...love to see it 'Brick-Built'. These are spectacular. LOVE the angled facade on the first one. Any chance of you shared your files? 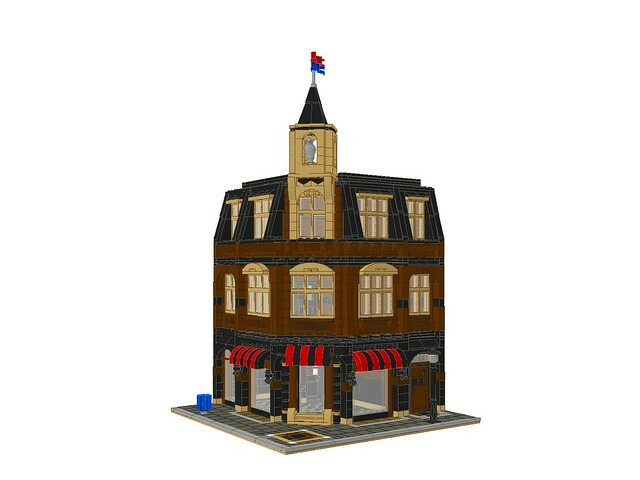 Would love to learn your techniques, and build something similar for my town. No interior on this one either, sorry, but it does demonstrate how well 3x12 wings work with the angled walls, and I've tested it IRB as well, so this one is very much buildable. Totally understand, and that stinks that that happened. Thanks for the link, though, and additional pics! Now that's impressive......your latest design is very original....I wonder if anyone will try and brick build it ? Brick On LDD On 'Freddie' !